Copywriter | Portfolio | Press Releases . I wrote this press release on behalf of an African aid charity about to launch its annual Christmas gift catalogue. Although the aims and purposes of the charity could not be more serious, I wanted to give the release a light-hearted mood, hence the title "Buy A Goat For Christmas". Local print and radio media in the South of England. 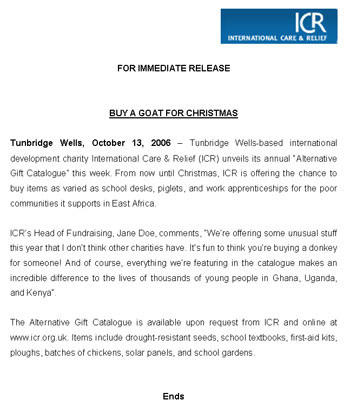 Tunbridge Wells-based international development charity International Care & Relief (ICR) unveils its annual “Alternative Gift Catalogue” this week. From now until Christmas, ICR is offering the chance to buy items as varied as school desks, piglets, and work apprenticeships for the poor communities it supports in East Africa. ICR’s Head of Fundraising, Jane Doe, comments, “We’re offering some unusual stuff this year that I don’t think other charities have. It’s fun to think you’re buying a donkey for someone! And of course, everything we’re featuring in the catalogue makes an incredible difference to the lives of thousands of young people in Ghana, Uganda, and Kenya”. The Alternative Gift Catalogue is available upon request from ICR and online at www.icr.org.uk. Items include drought-resistant seeds, school textbooks, first-aid kits, ploughs, batches of chickens, solar panels, and school gardens.